This bleak book about a group of broken people in a dying Midwestern town fell too close to reality for me. The writing and story telling were both exceptional. That’s probably why it left me feeling so hopeless. Markley’s novel follows a handful of “friends,” jumping between past and present (2013, to be exact) to reveal the actions and interactions that warped them as teens and damaged their futures. It’s powerful from start to finish, artfully connecting the dots between random events until you reach the devastating conclusion. The Great Recession, America’s military responses to 9/11 (two main characters go to battle), the growth of meth and opioid addition, political gridlock, and social malaise: this is the world these characters grew up in, along with the sometimes stifling influences of living in a small town. Whether these characters pursued goals one considers liberal or conservative, disillusionment was the result. However, there’s also a mystery here. And, Markey does a darn good job of keeping you in the dark until the shocking revelation. It’s an excellent book, but not for everyone. The small Ohio town of New Canaan holds a parade for a former star athlete who died in Iraq. Their is no body in the coffin and the high school friends in attendance have few lasting bonds to the dead boy or each other, despite their shared history. 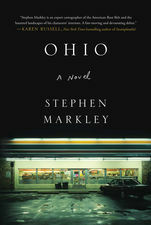 For more about Stephen Markey and his book, click here. This entry was posted on Thursday, October 4th, 2018 at 1:56 pm	and is filed under Book Reviews. You can follow any responses to this entry through the RSS 2.0 feed. You can leave a response, or trackback from your own site.